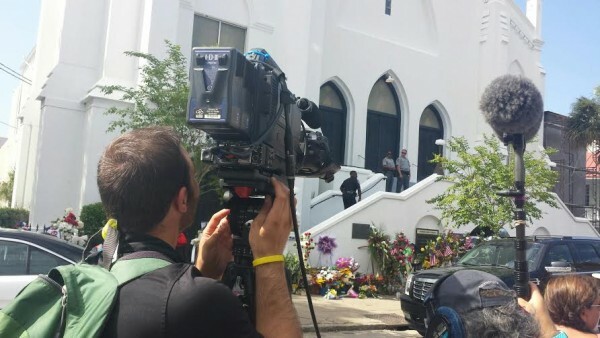 We shot B-Roll, stand ups, sound bites, and MOS of the funerals in Charleston after the shooting at Emanuel AME Church on June 17, 2015. We gathered B-Roll of the funerals of Ethel Lance and Sharonda Coleman-Singleton. The funeral services were packed full of family and friends, South Carolina politicians and other state officials. Governor Nikki Haley, Reverend Al Sharpton and Reverend Jesse Jackson were also in attendance. Supporters from other churches were present outside the church handing out water and preventing protesters from nearing the services. On the second day, President Obama was in attendance for Reverend Clementa Pinckney’s funeral. While the service didn’t start until 1:00 p.m. lines to get into the service formed as early as 4:00 a.m. and thousands and thousands of people turned up in support. Close to 10,000 people arrived in downtown Charleston for Rev. Pinckney’s funeral, most of which had to be turned away as the arena reached capacity. Some had been waiting since 4:00 a.m. in temperatures close to 100 degrees. We got some man-on-the-street sound with an ABC reporter as well as other sound bites and B-roll as people waited in line for the funeral of Rev. Clementa Pinckney. When we finished shooting each day, the footage I shot was relayed back to ABC’s NY Headquarters using LiveU and TVU packs feeding from our location in a hotel in downtown Charleston.